Alyssa Marie Long and Collin Long both enjoy the outdoors and camping, so when it was time to pick a site for their wedding in May 2017, it came as no surprise that they would chose a campsite. The couple wed at the Y.M.C.A. Camp Campbell in Boulder Creek, Calif., and their 100 or so guests stayed at the nearby Big Basin Redwoods State Park. Nearly 44 percent of all couples nationwide have wedding weekends incorporating multiple events into several days, according to a Knot Real Weddings Study conducted last year. And a growing number of them are booking campsites, wedding professionals say. Campsites offer space to accommodate a long guest list overnight as well as plenty of activities to occupy their time. Friends and family are able to bond in a more casual environment that feels like a minivacation. And costs are often less than at more conventional events spaces and hotels. Campsite wedding costs will vary, though many facilities charge less than $10,000 for two days. Camp Wandawega in Elkhorn, Wis., charges $22,000 for weekends and $10,000 on weekdays for a two-day rental of their grounds, including accommodations for the guests. The beauty of the outdoors also makes for a glamorous backdrop for wedding photos. Luke Leasure, who with his wife, Mallory Leasure, operates the wedding photography company Luke + Mallory in Portland, Ore., estimate that a third of the weddings they shoot each year are at campsites, including the Longs’s at the Y.M.C.A. Camp Campbell. “People are wanting an adventure wedding, especially those who don’t like the dog-and-pony show of conventional wedding traditions,” Mr. Leasure said. In their work, the Leasures have seen couples employ typical camp activities, like yard game competitions, kayak trips, and s’more creations. Some rename the camp with their monikers, others create a theme. 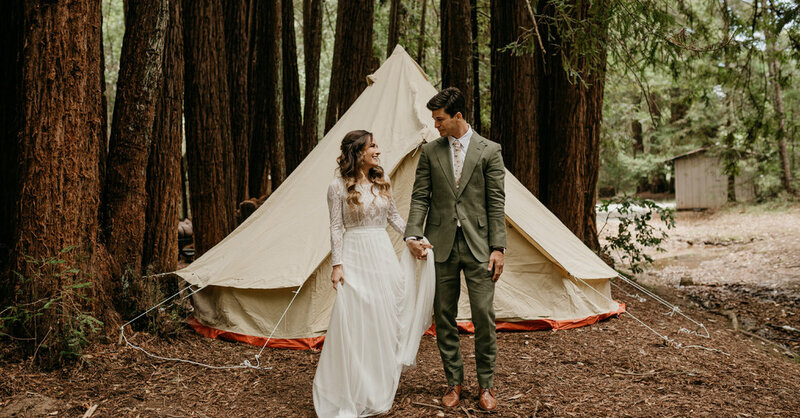 Campsite weddings may seem idyllic, but having one can also be challenging, especially for guests used to spending the night in a hotel before getting ready for a ceremony. Traditional wedding sites offer amenities like electricity, furniture, shelter, and even stable ground, all of which cannot be guaranteed with campsites. Simple is key when it comes to a campsite. Cellphone service is often spotty and you can’t always rely on Wi-Fi. For the actual wedding day, it can be both a blessing and curse. Guests won’t be viewing the ceremony through an Instagram filter, but it does pose challenges for vendors. Teissia Treynet, who runs Firefly Events, an event planning and design company with offices in New York, California and Wyoming, suggests walkie talkies. She also advises couples to set up charging stations for guests who do want to use their devices to reserve other outlets for powering equipment and lighting for the ceremony and reception. She confirms with the site that generators are available, and rents additional units as necessary. Light can be another hurdle. Many campsites lack lamps along pathways, in tents, and in many parts of the property. To keep guests safe and make it easier to move about, Ms. Treynet suggests hanging bistro lights from trees and placing solar lights along walkways. She also suggests setting up a “camp store” where guests can borrow supplies such as lanterns, flashlights, and more. Otherwise guests will need to be told to bring along flashlights. Guests should understand that they will be exposed to natural elements. Ms. Treynet says that couples should share a packing list with their guests, including items like bug spray, sunscreen, camping equipment, coolers, blankets and towels. Footwear can also be an issue at a campsite wedding. Because of unstable ground, heels are generally a no-go, Mr. Hernandez said. The same goes for open-toes, which can catch gravel, wood chips, or other natural elements. For larger properties, couples should consider having golf carts available to help guests with limited mobility get from place to place. Couples looking for a bit more comfort might consider so-called glampsites. Glamping typically involves fancier tents, and amenities such as private bathrooms, electricity in the tents, higher ceilings, beds with linens, and sometimes even air-conditioning. It’s basically a hotel room under a cloth ceiling. Some glampsites offer cabins. The camp’s founder and chief executive, Dan Braun, explained that he wanted to design an event space that evoked the nostalgia of growing up at camp but where “everyone can stay on-site, even grandma.” He says he strives to work with couples that value the ability to connect with friends and family on a deeper level without letting go of all amenities. Similarly, Ventana Big Sur, just south in Big Sur, Calif., recently opened a glampground in a Redwood Forest to serve couples who want a laid-back and natural celebration with more luxury. While some guests a stay in a glampsite-atmosphere with tents, guests looking for a proper hotel can stay at the main resort property a few miles away. Whether at a simple campsite or an elaborate glampsite, couples will still face off with nature. Alternative plans should be made for any outdoor activities, as weather is always a factor. “You should really love the rain plan,” Ms. Treynet said, noting that snuggling up with board games can be just as entertaining as kayaking on a lake. And then there are all the things that come with being outside: sun, dirt, bugs and critters. Mr. Leasure recalled a wedding where he found a squirrel chowing down on one of the cakes on display. The coordinating team tossed the cake, and the guests were none the wiser.